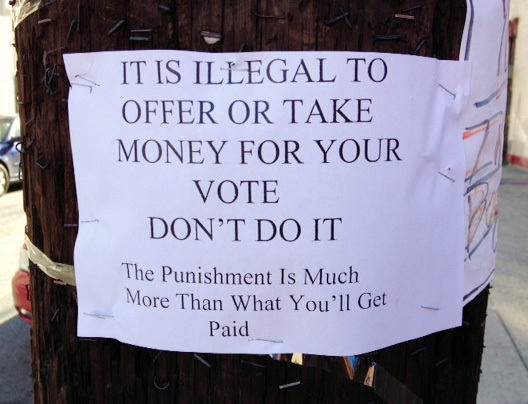 In September 2013 residents tried to warn voters about vote buying with signs wrapped around telephone poles. Hoboken resident Frank "Pupie" Raia was indicted last month in relation to a 2013 vote by mail scheme. 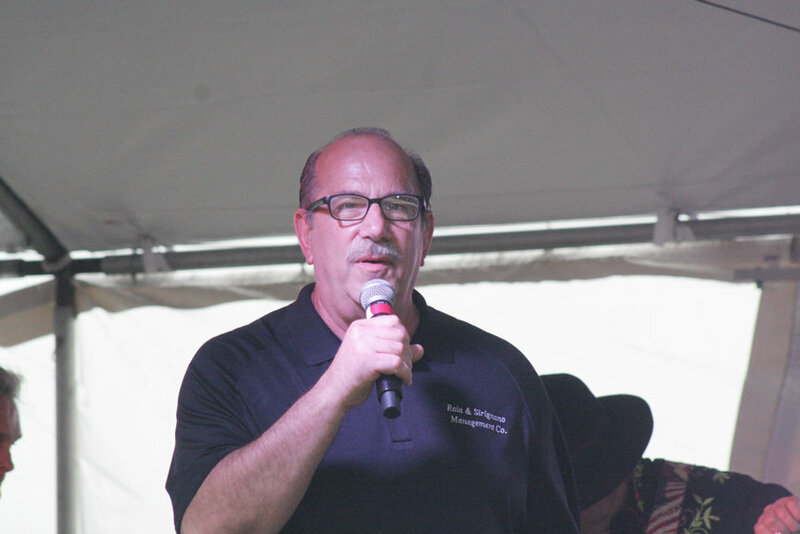 The U.S. Attorney’s Office announced on Oct. 31 the indictment of longtime Hoboken political player Frank “Pupie” Raia — a former councilman, mayoral candidate, and current real estate developer — for his alleged involvement in a vote-buying scheme in Hoboken in 2013. Raia, 67, has been involved in Hoboken politics for decades. He was charged with “conspiracy to violate the federal Travel Act for causing the mails to be used in aid of voter bribery” along with Hoboken resident and 2013 campaign worker Dio Braxton, 43. Raia allegedly “directed” Braxton and others to promise voters that they would be paid $50 if they cast mail-in ballots in Hoboken’s 2013 race, in which he was an at-large council candidate on a slate labeled One Hoboken. During that election, there was a race for mayor and for three at-large council seats. Raia was running on the “One Hoboken” council slate with former Board of Education Trustees Peter Biancamano and Britney Montgomery, backed by former Councilman Tim Occhipinti, who was running for mayor. No one else from the “One Hoboken” slate has been charged. Ultimately the winners of the election were Mayor Dawn Zimmer and council members James Doyle, Ravi Bhalla, and David Mello. A third group also ran, with Councilman Ruben Ramos for mayor at the head of that slate. According to the complaint, Raia also chaired the Let the People Decide PAC, which worked to loosen the rent control laws in town. A referendum was held to loosen those laws, but ultimately, residents voted to maintain their rent control laws. Raia’s indictment comes after the indictment of Hoboken resident and campaign worker Lizaida Camis in September. She was charged with a violation of the Travel Act for allegedly using the mail system to aid voter bribery. It also says that the PAC, at Raia’s “direction”, paid a company to print the checks for the voters, which were then distributed at an office Raia owned in Hoboken. Raia did not return calls for comment. But his attorney, Alan Zegas, said Raia was “rather surprised” by his indictment. The lawyer noted Raia’s positive contributions to the community. “He has been a giving member of the community and done many good deeds in Hoboken, including starting a charter school,” said Zegas. Raia, a self-made millionaire, has served on the Board of Education, the Hoboken City Council, and the North Hudson Sewerage Authority. He also helped found HOPES, a local non-profit that provides early childhood education services and other services to those in need. Last year the organization named their new annex near Third and Garden streets after him. As a developer, he has rehabbed buildings such as the Citadel in the center of town and more recently was involved with development in the city’s formerly industrial northwest section. He also holds a birthday party for himself every year on the waterfront, open to all. Politicos from all factions of local politics have attended. No court date for his arraignment had been scheduled by press time. In an email to constituents, Councilwoman Tiffanie Fisher said people weren’t surprised by the indictments of Raia and Braxton. Rumors of alleged vote-buying have persisted in almost every Hoboken election and, over the years, various government entities have announced investigations into voter schemes, but they’ve rarely borne fruit. Raia has run for various offices since the 1980s, particularly in the 3rd Ward. He served on the City Council for a few months in the mid-’80s. Current 3rd Ward Councilman Michael Russo did not return a call for comment. If found guilty, Raia and Braxton each face a maximum penalty of five years in prison and a $250,000 fine.